For any business tracking purpose, it is important for you to keep track of the gas mileage of your business vehicle. With the help of this log, a person can keep track of the cost of the travel, the total consumption of gas and a lot of other details related to the gas mileage. Some people also like to use this log for the purpose of reimbursement. This simplifies the process of tracking the mileage so that the budget of the individual can be controlled. The use of gas mileage tracker makes it easier for the person to remove all the pending dues. The template for the mileage log can also be downloaded from this website. This template is simple to use and contains many customizable features that make it convenient for the user to edit this worksheet according to his needs. This log is present in MS Excel format and also work as vehicle mileage tracking. Keeping the mileage log worksheet is very important for you if you want to get the deductions in tax returns. Many people check their vehicle’s mileage after regular interval of time but don’t bring it in written form. 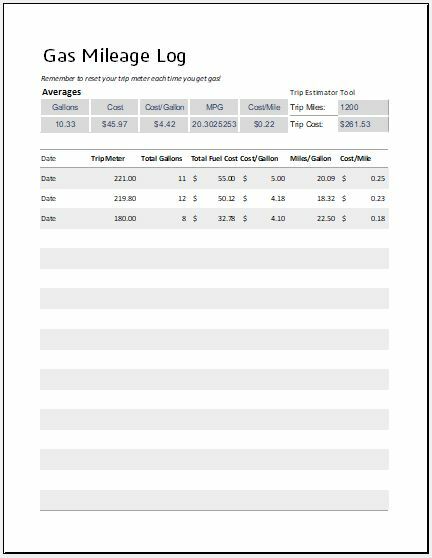 Using a document can be helpful for you because it starts recording everything about the gas mileage and can give you a sufficient amount of information at the end.